Promotional laptop bags are a product that needs to be strong and durable, meaning your message imprint will be seen for a very long time. That is a good thing! Many are made from strong canvas or heavy duty PVC vinyl. They should hold the standard size laptop and have a strong shoulder length adjustable strap for carrying. Extras include flaps, pockets, pen holders, and other storage areas. Some bags are so high end that they have upscale bits such as antique brass fittings. They also sometimes come with storage that will expand when needed. The bag needs to be designed to cushion the laptop and keep it safe from being damaged. Giving one of these is a great way to give kudos to a deserving employee.Whether for doing a superb job or just to show appreciation. 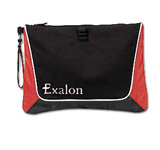 These bags can be imprinted or embossed, or embroidered with a company or product name or logo. Color selection is available, but many choose dark colors like blue or black because dirt will show up less on those colors. A decent laptop bag will stay useful for a year even with everyday use. That means that for a year plus promotional info will be reaching the public eye. That is pretty good in advertising terms. The prices aren’t crazy for laptop bags. If you need wheels and other nifty options the price will reflect that naturally. There are things to consider when deciding on which type of bag. What is the target audience, how many will be needed, and the focus of giving them away. These items satisfy all the needs of well heeled advertising.